Recently, I picked up a book I have read twice previously. 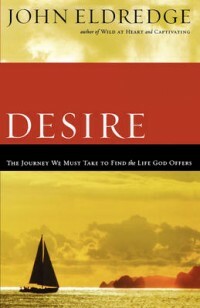 It is John Eldredge’s The Journey of Desire, or now entitled Desire. Whereas some have not appreciated Eldredge’s writings, thinking it is somewhat humanistic or noting his deep passion for the outdoors, I do truly enjoy his works and what he is communicating. And I especially enjoy The Journey of Desire. The book is mainly about the central aspect of desire in our lives. That it is a God-given and good reality, not something evil in and of itself. It can be utilised for wrong, for sin, for evil. But desire is good and healthy itself. Still, one gets the sense that much of the church tries to teach that desire is wrong and that we should get rid of it. I believe such is a tragedy, for what are we if we are not creations with deep desire and passions? We live life as if this is just the way it should be. We wake up, brush our teeth, maybe eat breakfast, go to work, come home, eat dinner, watch tv for an hour or two, go to bed – all that might do the same thing tomorrow. Life is just this way and that is how it will always be. In the midst of the cycle, our desires are killed. But, if we listen carefully, He might begin to speak and breathe life into that which has been suppressed and buried under a hearth of apathy and duty. “What do you want?,” asked Jesus to a blind man. Pretty obvious, huh? But had he forgotten what he wanted deepest – to see again. What do we want? Or have we forgotten what lies within the life granted to us? This entry was tagged books, devotional, John Eldredge, quotes. Bookmark the permalink.